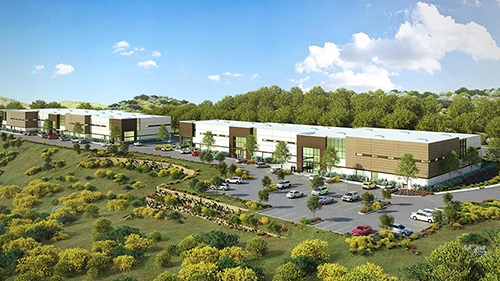 Badiee Development plans to break ground in early 2017 on Keystone Victory Industrial Park, a two-building, 77.9k sf industrial project in Vista. The development is located on one of the last available industrial parcels in Southwest Vista at the end of Keystone Way off Business Park Dr.
Keystone Victory Industrial Park is valued at $13.9 mil, including the recent purchase of a 10-gross acre, raw land parcel yielding five net developable acres. The project will provide tenants opportunities to occupy individual buildings, or for multiple tenants to lease smaller suites ranging between 5k sf – 18k sf each. The buildings will feature state-of-the-art design and amenities with 26-foot clear height, grade-level and dock-high loading, and common outdoor areas with contemporary landscaping and expansive views over Carlsbad to the Pacific Ocean. Tucker Hohenstein and Mike Erwin with Colliers International represented Badiee Development in the purchase of the parcel and are the leasing brokers for Keystone Victory Industrial Park.